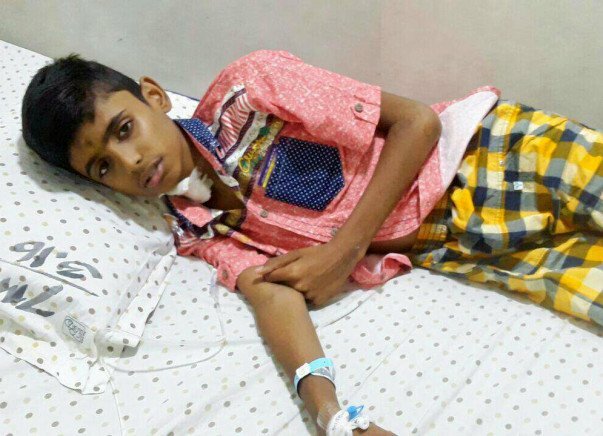 Harish Raghavendra is a 13-year-old son. He has a little brother. He was recently diagnosed with blood cancer (Acute Myeloid Leukemia or AML m2). He is admitted to Kanchi Kamakoti Childs Trust Hospital, Chennai. He started receiving chemotherapy a few days back and one week of chemo course has been completed. 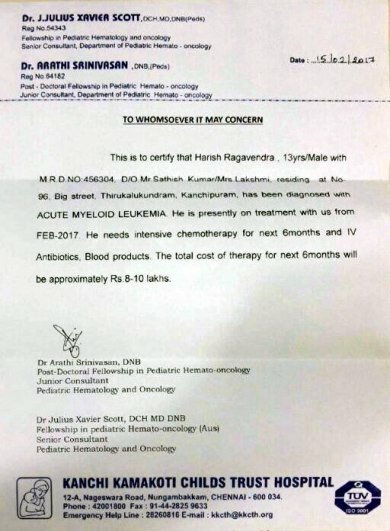 The doctors at this hospital have given their parents an estimated cost of Rs. 8-10 lakhs for the next six months. They are frightened about his condition and also feel helpless about the money to be spent for the treatment. The doctors say that the whole treatment and related therapies will take up to five years and will cost up to Rs. 30 lakhs. Sathish Kumar, his father, working in a travel agency near Mahabalipuram. They live in Thirukkazhukkundram, a small town in Tamil Nadu. They are a typical middle-class family that can't afford this treatment. Harish is a very active child who is always up to some mischief. Effects of his disease, such as tumors around eyes and bleeding, have started showing and he has become bed-ridden. His doctors say chemo will make it worse and he will need expensive medication to counter its effects. It's unbearable to see him like this. He gets angry and has not fully realized his condition. He has seen his grandmother survive breast cancer and go through a serious relapse again. The parents want to save Harish from the horror. Dear donors, they appeal to you to help him have his childhood, save him so that he lives a normal, fun life as much as possible. Any help is appreciated.